What Day Of The Week Is December 19? 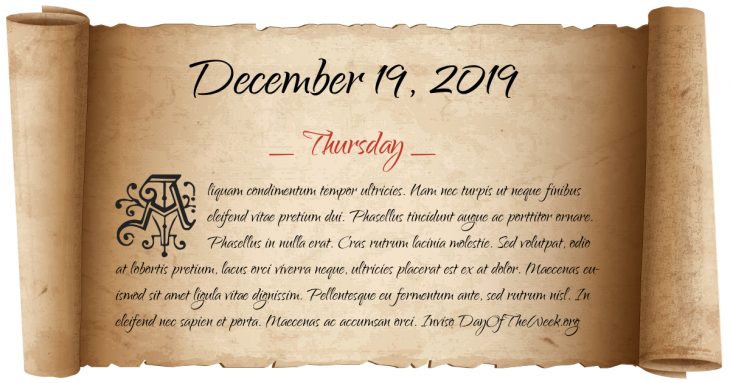 December 19, 2019 is the 353rd day of the year 2019 in the Gregorian calendar. There are 12 days remaining until the end of the year. The day of the week is Thursday. Hopetoun Blunder: The first Governor-General of Australia John Hope, 7th Earl of Hopetoun, appointed Sir William Lyne as premier of the new state New South Wales, but he is unable to persuade other colonial politicians to join his government and is forced to resign. World War II: Limpet mines placed by Italian divers sink the HMS Valiant and HMS Queen Elizabeth in Alexandria harbour. Zanzibar gains independence from the United Kingdom as a constitutional monarchy, under Sultan Jamshid bin Abdullah. Argentine economic crisis: December 2001 riots – Riots erupt in Buenos Aires. Who were born on December 19?